Project Cuddle Bags supports our children who are victims of domestic violence situations. After speaking with refuges, they expressed how the children are at a very sad time in their lives and are in need of assistance and reassurance. We then saw an opportunity to give these children some comfort at this difficult time and to help make a very sad time a little bit happier, helping each child to gain some confidence and knowledge that life will get better. A Cuddle Bag costs £60 and will help with a child’s needs making a distressing time that little bit easier. Please contact us today if you are able to make that difference. Each bag will be of personal interest to the child with the unique gift provided as we endeavour to help each child smile once again. How do I sponsor a Cuddle Bag? Each bag will cost £60 and contain the items listed above. 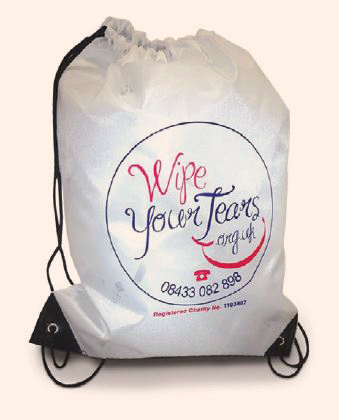 Sponsor a bag now, alternatively you can email wendy@wipeyoutears.org.uk your name will be added to our list of sponsors on the website the following calendar month. Simply email wendy@wipeyoutears.org.uk. Your name will be added to our list of Corporate Sponsors on the website the following calendar month. All corporate sponsorships are fully tax deductible.